Ikea’s Swedish meatballs are one of the primary reasons we’re still willing to drag ourselves to the supersize home goods retailer instead of just ordering online — after a day of elbowing through the crowds and lugging flat-pack furniture out to the car while our loved ones seethe beside us after the inevitable fighting over which side table to get, nothing hits the spot like a plate of meatballs swimming in creamy gravy. But if you’re tired of the standard beef, chicken and meatless balls, you’re in luck! That’s because Ikea just introduced sustainably sourced salmon balls to the menu. 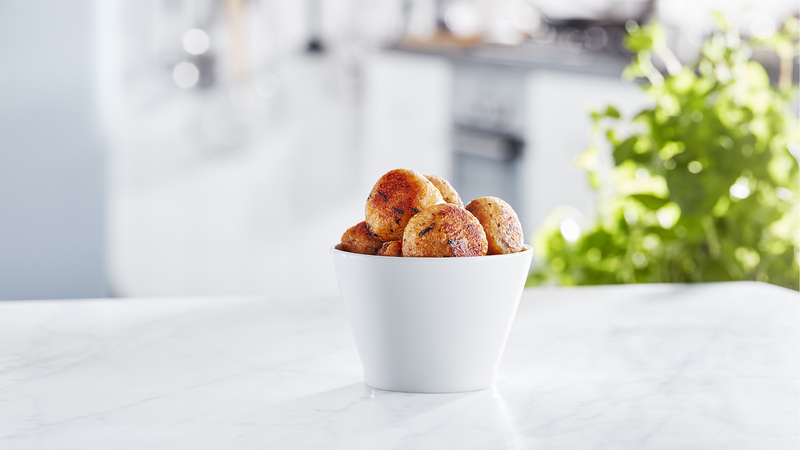 These unique salmon balls were developed with certified sustainably sourced salmon, in conjunction with the Aquaculture Stewardship Council. What makes them really special, though, is that they don’t use meat from the prized fillet. Instead, these balls are made with the just-as-tasty morsels on the rest of the fish that often go to waste. This means less fish overall need to be used to create this product. The fillets can be processed to be sold elsewhere, and the rest of the meat can be used to make the salmon balls. The salmon is then mixed with cod and seasoned with seaweed and lemongrass to create an aromatic, savory dish. The salmon balls were originally tested in the Portuguese market, where 80 percent of diners said they enjoyed them and 90 percent said they appreciated how sustainable the product is. Now, they’ll be available in the U.S. and are expanding to other international locations too. Served with the classic mashed potatoes, gravy and lingonberry jam, these salmon balls are just the salve your soul needs after a harrowing day of bargain-hunting at our favorite Swedish superstore.